Easy fabrication of thin membranes with through holes. Application to protein stencil patterning. Master,T et al Submitted Lab on Chip. Abstract: Since protein patterning on 2D surfaces has emerged as an important tool in cell biology, the development of methods that can be easily implemented in biology labs has gained importance. In this paper we present a simple, rapid and reliable technique to fabricate thin layers of UV curable polymer with through holes. These membranes are as easy to fabricate as microcontact printing stamps and can be readily used for stencil patterning. 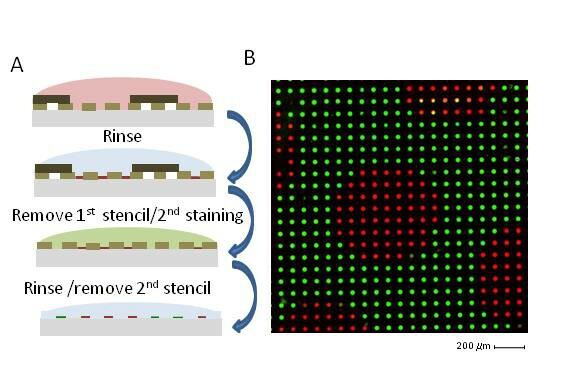 We show how this microfabrication scheme allows highly reproducible and highly homogeneous protein patterning with micron sized resolution on surfaces as large as 10 cm2. Using these stencils, fragile proteins were patterned without loss of function in a fully hydrated state. We further demonstrate how intricate patterns of multiple proteins can be achieved by stacking the stencil membranes. We termed this approach microserigraphy. Vers une cartographie des tensions mécaniques intracellulaires? Viasnoff, V. (2011). “Towards mapping mechanical tensions inside cells?” Med Sci (Paris) 27(1): 14-16. Les stimuli biochimiques étaient considérés jusqu’à la fin des années 70 comme seuls acteurs de la régulation de l’activité cellulaire, la morphogenèse ou la différentiation cellulaire. Il est progressivement apparu que les contraintes mécaniques pouvaient elles-aussi, jouer un rôle de stimulus externe lors de ces processus [1-2]. Les cellules sont en effet capables de sonder et de réagir aux sollicitations mécaniques exercées soit par les autres cellules soit par leur environnement (ex : matrice extra cellulaire ECM). L’intégration de ces stimuli et leur transduction en voies d’activation biochimiques sont actuellement un domaine d’étude en pleine expansion . Par exemple, certaines voies de régulation peuvent être activées lors de l’ouverture de pores membranaires mécano-sensibles consécutive à l’augmentation de la tension de membrane ou bien encore par l’enrichissement local de récepteurs et d’effecteurs au niveau de la déformation du cortex. Enfin l’application de contraintes locales dans le cytoplasme conduisant à la déformation de protéines révélant des sites catalytiques ou de recrutement constitue une autre voie possible de transduction mécano-chimique. La capacité d’une cellule à répondre efficacement à une sollicitation mécanique est largement liée à la mise en tension permanente de son cytosquelette via les réseaux dynamiques de filaments interconnectés. L’existence de cette précontrainte permet une transmission physique (donc extrêmement rapide) des sollicitations mécaniques externes qui pourraient potentiellement être intégrées au niveau de la membrane cellulaire ou du nucléosquelette afin d’activer le programme de transcription génétique approprié. I am currently on sabbatical at the National University of Singapore working on the mechanobiology of the cells. You can now read my thesis as an e-book. Just for fun. Is the in vitro ejection of bacteriophage DNA quasi-static? A bulk to single virus study. N.Chiaruttini et al Biophys J, 99 (2) 2010. Bacteriophage T5 DNA ejection is a complex process that occurs on several time scales in vitro. Using a combination of bulk and single phage measurements we quantitatively study the three steps of the ejection: binding to the host receptor, channel opening step and DNA release. Each step is separately addressed and its kinetics parameters evaluated. We reconstruct the bulk kinetics from the distribution of single phage events following individual DNA molecules with unprecedented time resolution. We show that at the single phage level the ejection kinetics of the DNA happens by rapid transient bursts that are not correlated to any genome sequence defects. We speculate that these transient pauses are due to local phase transitions of the DNA inside the capsid. We predict that such pauses should be seen for other phages with similar DNA packing ratio. connecting two chambers can produce local temperature increases of up to 100 °C with gradients as large as 1 °K /micron. We find a good agreement between the measured temperature profiles and a finite elements-based numerical calculation. We show how the thermal gradients can be used to measure the full melting profile of DNA duplexes within a region of 40 microns. The possibility to produce even larger gradients using submicron pores is discussed. 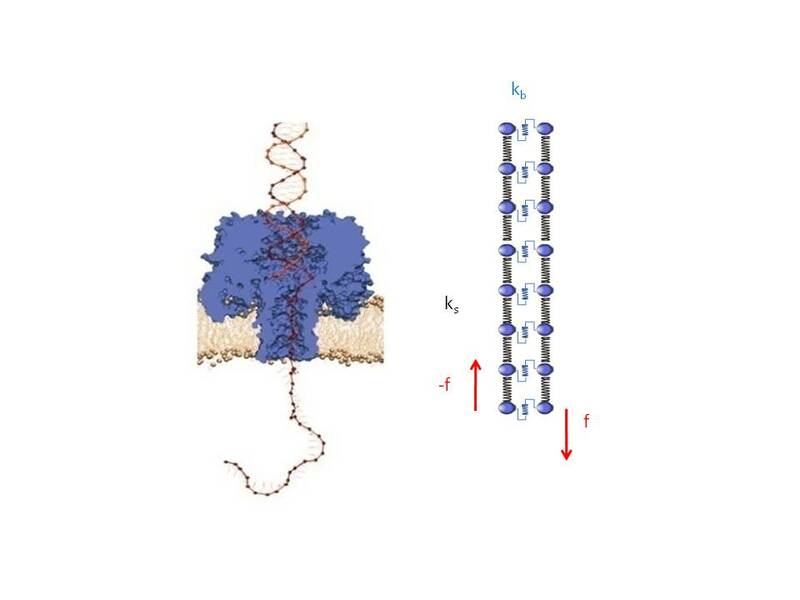 DNA translocation and unzipping through a nanopore: some geometrical effects. DNA Duplexes can enter alphahemolysin pores from both sides. However when the vestibule is entered first the DNA is hold in front of the stem entrance. Unzipping is then faster. Abstract: This paper explores the role of some geometrical factors on the electrophoretically driven translocations of macromolecules through nanopores. In the case of asymmetric pores, we show how the entry requirements and the direction of translocation can modify the information content of the blocked ionic current as well as the transduction of the electrophoretic drive into a mechanical force. To address these effects we studied the translocation of single stranded DNA through an asymmetric alphahemolysin pore. Depending on the direction of the translocation, we measure the capacity of the pore to discriminate between both DNA orientations. By unzipping DNA hairpins from both sides of the pores we show that the presence of single strand or double strand in the pore can be discriminated based on ionic current levels. We also show that the transduction of the electrophoretic drive into a denaturing mechanical force depends on the local geometry of the pore entrance. Eventually we discuss the application of this work to the measurement of energy barriers for DNA unzipping as well as for protein binding and unfolding.